With the explosion in computer use some years ago, it seemed that the typewriter joined the annals of antiquated inventions like the rotary phone, the horse buggy and the Sony Walkman. Now it looks as though the era of the typewriter has finally come to an end. According to an article from the Daily Mail Reporter, the world’s last typewriter factory has closed its doors. Godrej and Boyce, a Mumbai, India-based company, shut its doors with only 200 typewriters left in stock. 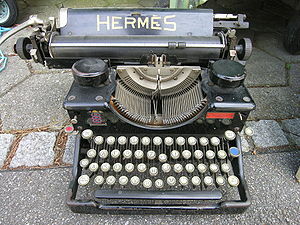 Although typewriters became obsolete years ago in the west, they were still common in India – until recently. Demand for the machines has sunk in the last ten years as consumers switch to computers. Reading this article reminded me of an antiquated typewriter I owned, bestowed upon me by my father at nine, after I had openly declared my dreams of becoming a writer. I pounded out many poems on that typewriter. Years before my father even married my mother, my father took a crack at the publishing industry by banging out a novel on the device. I don’t know the typewriter’s model (I was a kid; I wouldn’t have pay attention to stuff like that), but I remember that it was grey, and the keys were hard to punch. At the rate I type now (which is 79 wpm — no lie), the keys sticking together would hinder my typing speed (and thus my progress) and make me feel uncomfortable. The machine’s case came in a beige, dry leather case; it had a pocket I stuffed unused and typed-up papers in. Nostalgia came over me tonight while I was at work, and I decided to look for that typewriter. I figured it would be crammed deep into the coat closet in my living room. As soon as I got home, I cleared out the front of the coat closet (what with its deep storage space and all) and peered deep into the closet for the familiar case. My mother asked me why I was clearing out the closet, and I told her the reason. She said the typewriter got thrown out. What a shame. It would have been nostalgic of me to look at that typewriter, to try typing on it, and maybe even show my daughter the computer’s predecessor. And I was going to find out the machine’s model so I could have put that information in this post.